Ltest Architectural Rendering of Doctor Pickens Museum of Turquoise Jewelry and Art. Dr. Pickens Museum of Turquoise Jewelry and Art is located about three miles west of Ponca City out by the Christmas Tree Farm on Highway 60. 1.1 What are you building? 1.2 Where will Doctor Pickens Museum be located? 1.3 Why isn't the museum being built in Ponca City? 1.4 How large will Doctor Pickens Museum be? 1.5 When will Doctor Pickens Museum be built? 1.6 How will the museum promote Ponca City? 1.7 How can I learn more? 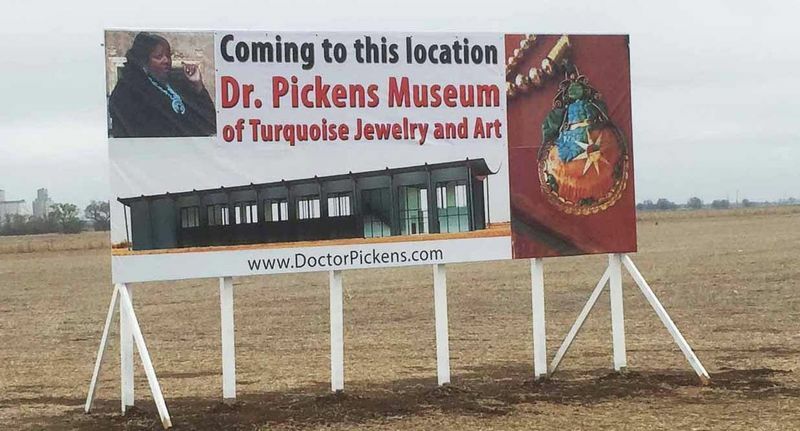 We are building a museum to display Doctor Pickens collection of turquoise jewelry as well as paintings, fiber art, and sculpture by Oklahoma and Native American artists. Where will Doctor Pickens Museum be located? The museum will be in Kay County, Oklahoma about three miles west of Ponca City out by the Christmas Tree Farm on Highway 60. The museum will be built on the tract of farmland with one-half mile of frontage on Highway 60 between the Christmas Tree Farm and U Street on the south side of Highway 60. Why isn't the museum being built in Ponca City? According to an article in the Tulsa World, 1.8 million visitors went to Pawhuska to visit Ree Drummond's Pioneer Woman Mercantile in 2017. Right now, visitors going to Pawhuska from I-35 using their GPS bypass Ponca City and go straight to Pawhuska through the Ponca Refinery. For someone driving from I-35 to Pawhuska, the museum is located one mile before Highway 60/177 splits with one leg going to Ponca City on 177 and the other leg going to Pawhuska on 60. The museum will be on the south side of the Highway 60 (the right side if you are traveling east to Pawhuska) and will have an exit at U Street. Everyone who is driving From I-35 to Pawhuska will now pass by the museum on the way to the Mercantile. We expect to take advantage of the heavy traffic going to Pawhuska. We want some of those the 6,000 daily visitors to Pawhuska to stop at Doctor Pickens Museum. How large will Doctor Pickens Museum be? The museum will be 16,000 square feet and will be 270 feet long, 60 feet wide, and 40 feet high. When will Doctor Pickens Museum be built? The museum is now being designed by Architect Caveh Masum and the firm of amoARCH. We expect the final detailed design documents to be complete by the end of 2018. We expect to break ground in 2019 and expect the museum to open in 2021. How will the museum promote Ponca City? One of the purposes of Doctor Pickens Museum will be to get some of the thousands of people going to Ree Drummond's Mercentile in Pawhuska to slow down and stop near Ponca City. Once they visit the museum we will be telling visitors about the many attractions in our hometown including the original Pioneer Woman, the Marland Mansion, and the Marland Grand Home. Photos and text on this page are copyright Hugh Pickens and may not be reused without written permission. This page was last modified on 17 April 2019, at 04:14. This page has been accessed 22,007 times.